Thanks to the ingenuity of many a great coffee machine manufacturers, you can become your very own barista by making the perfect cup of espresso right in your own kitchen. If you have ever wanted to brew your own espresso, then you definitely need to check out our extensive list of the best espresso machines for your kitchen. I’m confident that you will find one right for you so you can stop visiting the baristas in your local coffee shop every time you get a craving for an amazing cup of espresso. A good cup of espresso isn’t just the domain of coffee shops with their baristas. With these affordable espresso machines, you can make your home at home so you can avoid those high charges just to get a good cup of espresso each day. The best part of these machines? The price! Since they are so affordable, what are you waiting for? You can become your own barista today and start making great cups of espresso in your very own kitchen. If you are looking for an easy way to make espresso, cappuccino, or even lattes, look no further than the Mr. Coffee Café Barista Espresso Maker. Featuring a one touch control panel, you can easily brew any type that you crave. 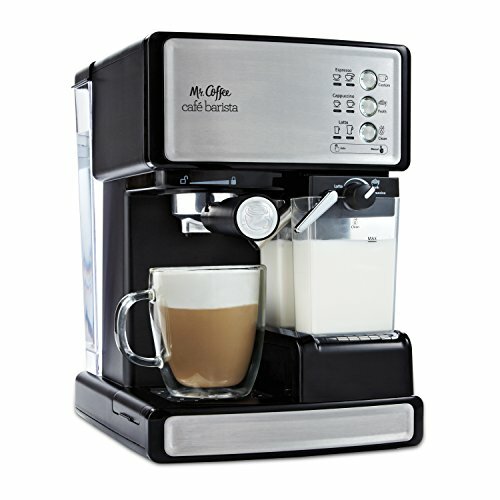 It even includes an automatic milk frother that will help you create the creamiest cappuccinos and lattes right in your own kitchen. The tray is adjustable for various sized cups and mugs and cleanup is a breeze as virtually every reservoir is easy to remove and clean. 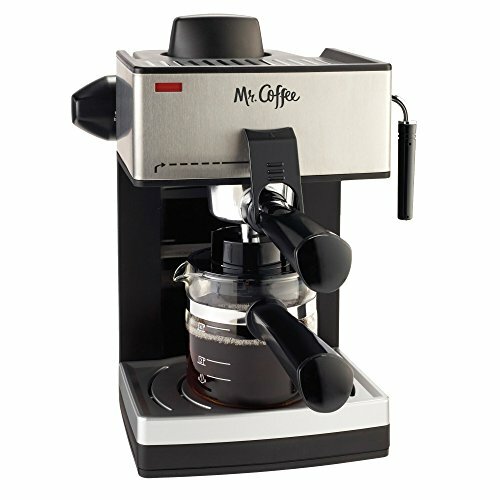 If you are looking for easy, the Mr. Coffee Café Barista Espresso Maker should definitely make it to your short list. If you searching for affordable yet professional, then the De’Longhi ECP3420 is worth a closer look. Its design is sleek and stylish and it features 15 bar professional pressures to assure the best brewing results every time. It also includes a second tier drip to accommodate those of us that prefer larger cups so we get a little more than the standard espresso size. With its stainless steel boiler system and self priming, it requires minimum prep to start up. While there aren’t as many frills as other machines, this model will guarantee a great espresso with each and every brew. The Nespresso Pixie Espresso Maker features compact brewing technology and thermoblock heating for fast prep time each time you turn it on. 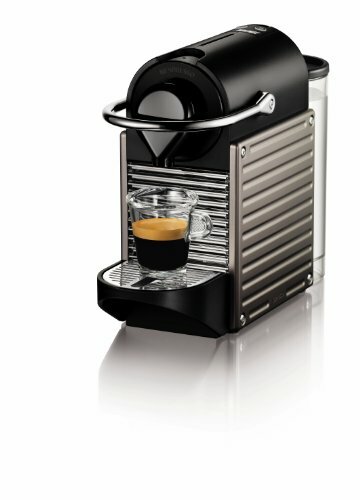 It includes programmable buttons for espresso and lungo and even includes settings for larger cups. With its backlit LED indicators, the Nespresso looks modern and stylish and with its auto power off features you don’t have to worry about remembering to turn it off in the morning. If you are looking for an espresso maker that easy to use and quick to operate, this could be the perfect choice for you. The perfect machine for the espresso lover on a budget, the Mr. Coffee ECM160 looks stylish and gives you just the right amount of features to brew a thick and rich espresso. While it does lack some of the more advanced features you find on the higher end models, its price tag is much friendlier on your wallet. 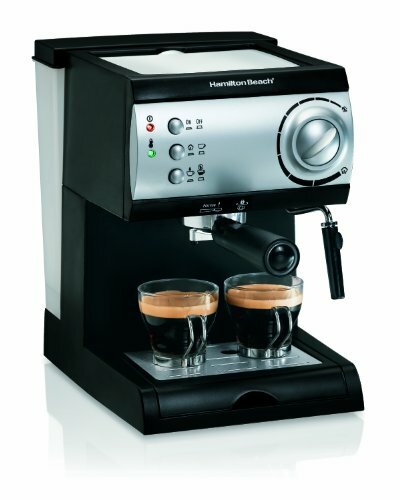 Overall, this is a quality espresso machine that is very popular because of its affordability. If you want to enjoy a dark, rich espresso but don’t have the budget to drop on one of the more expensive models, this could be the perfect answer for you. The De’Longhi EC155 is yet another great choice in the affordable espresso maker line. It features a stainless steel boiler that is durable wrapped in a stylish design that will make it the perfect addition to any kitchen. It can use pods or ground coffee in a patented dual function filter holder and features separate thermostats that allow for both water and steam pressure to be controlled for a great cup of espresso every time. Hamilton Beach has earned quite the reputation for creating small, affordable appliances that work great while remaining quite affordable, and the Hamilton Beach Espresso Maker is no different. Featuring a simply push button operation, it is easy to use even for absolute beginners. If you prefer cappuccino or lattes, the Hamilton Beach also includes a no fuss milk frother so you can create the perfect drink for almost anyone. The reservoirs are easy to fill and remove making this machine completely hassle free and great for anyone looking to brew espresso in their homes. 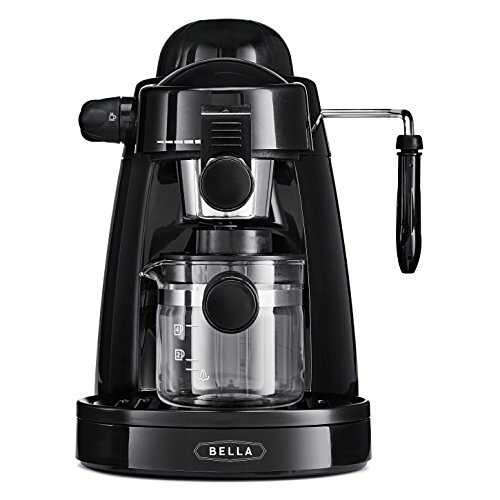 Another highly affordable machine on our list, the BELLA Espresso Maker will easily brew espressos and cappuccinos and even includes a steam pressurized safety cap so you don’t accidentally burn yourself while brewing the perfect espresso. If milk frothing is your game, then the easy to use steam wand will be your favorite accessory and the removable trays are easy to clean so maintenance is a breeze. If you are looking for an espresso machine that will do all the basics while staying very affordable, this is one of the best deals on this list. One of the more expensive options on this list, the DeLonghi EC702 includes the ability to use pods or coffee grounds for brewing and it features automatic self priming making it easy and quick to use each day. It includes an easy to use frother so you can also craft cappuccinos and lattes in addition to espresso, and the water tanks are easy to remove and clean. All of this is wrapped in a stylish stainless steel design that looks great and will match any modern day kitchen. If you are looking for a professional grade system and are willing to spend a little more, then the Delonghi EC702 is definitely worth your consideration. Do you prefer to brew the old fashioned way? Instead of a traditional espresso maker why not try this stovetop model. With different sizes available you can make anywhere from one cup all the way up to 12 cups right on your stove. It features a stylish aluminum design that is polished and looks great and it is easy to use and clean. It will take a little longer compared to the other options on this list, but there really isn’t anything like doing it by hand. So why not try espresso on the stove so you can get back to your roots while still enjoying the perfect espresso shot every time. 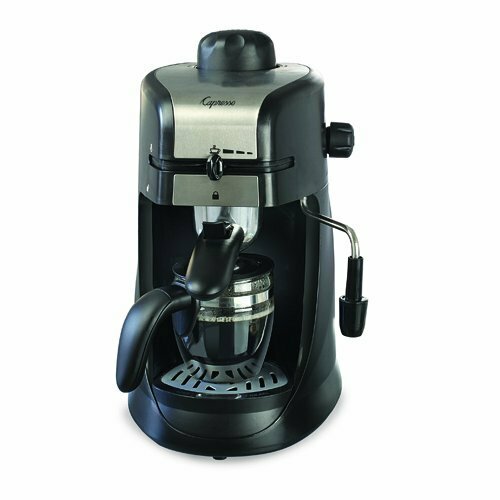 This 800-watt espresso and cappuccino machine features a capacity of 4 cups and includes both a coffee and steam selector so you can adjust your coffee strength along with a swivel frother. It includes a safety boiler cap with a built-in valve and a filter holder that includes a thumb guard to protect you from burns. Featuring a black design with illuminated switches, it looks great in many modern kitchens and the included trays are easy to remove and dishwasher safe. A great middle of the road espresso maker, this one could be perfect for anyone looking to brew espresso in their homes but don’t want to spend an arm and a leg. 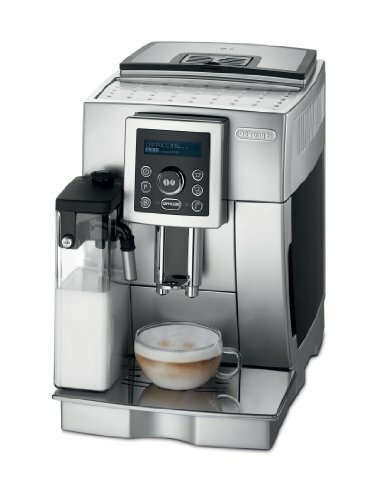 Not every machine from De’Longhi has to cost a fortune, and this model is made for those that just don’t want to pay more for an espresso machine than they would for a computer. That doesn’t mean it is without features. It includes a self priming operating to minimize startup time and utilizes a stainless steel boiler to ensure great water quality. Its 15 bar professional grade pressure gives you perfect results with each cup of espresso and it is even built to accommodate larger cups. These machines are truly some of the best of the best out there. While you may think that having the best means paying more, you may be surprised, as we have found some of the best espresso machines that are made for a variety of budgets. Take a look at some of these espresso machines if you are prepared to take your coffee habit to a whole new level. The Bambino takes up a really small amount of counter space, but produces coffee shop level results. The digital temperature control and the pre-infusion process ensure that the flavors are extracted as they should be. The push of a button, automatic milk steaming wand makes what can be a tricky part of the process super simple. Besides the simple features and small footprint, the 3 second heat up time is hard to beat. This demo video from WIlliams Sonoma shows how easy it really is to make a latte with the Bambino Plus. The heavy duty stainless steel construction of the first espresso machine on our list is not only durable, it looks pretty nice as well. It will standout nicely on any kitchen counter and the overall size of the machine won’t swallow your kitchen whole once you get it setup. It includes all the features you will need for a great espresso, including a frothing arm to make great tasting cappuccinos and lattes. On top of that it adds a cup warming tray to the top of the machine so your espresso stays hot longer. While it’s definitely not the cheapest espresso machine on this list, it does remain quite affordable for almost anyone. At the same time, it packs in many of the features espresso lovers look for in a quality machine. Its 15 bars of pressure ensures the perfect coffee drink every time and it includes a steam nozzle, frothing cup, tamping tool and a drip tray so there is no fuss and no mess. A great affordable option for espresso lovers and really the perfect option for anyone looking to expand their coffee drinking at home without breaking the bank in the process. One of the simpler Breville machines, the Duo-Temp is functional and efficient. It’s a semi-automatic, designed for pulling either one or two shots with a 15 bar pump, 1600W heating system, and 1.8: water reservoir. It also has a pre-infusion feature, a purge function, and a nice steam wand, which is great if you want to make milk-based specialty drinks. With its iron frame and stainless steel sides, this industrial looking machine in some ways recalls coffee makers from days gone by. At the same time, it packages in many modern features including an ergonomic porta filter handle and commercial grade group head for great heat stability and extraction quality. All in all, a quality mid range espresso maker for those that don’t have the budget for the Brevilles but want something more than a Mr. Coffee. 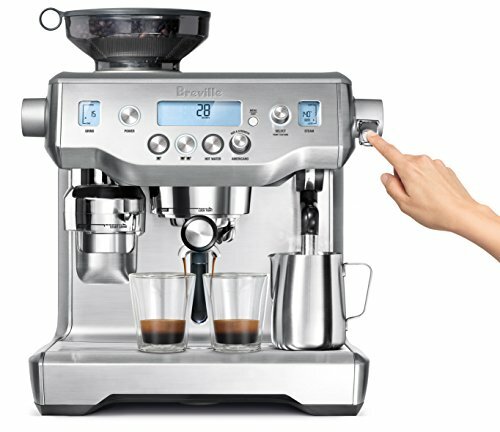 This Breville not only brews espresso, but it will even grind your coffee and measure it for you. This takes all the guess work out of making your espresso. On top of that, it includes programmable milk texturing features for the perfect froth with each cup and its dual stainless steel boilers will ensure you water is just the right temperature for the perfect espresso. If you are looking for the best o the best, then look no further, just be ready to shell out a little extra for all of these barista grade features. Another perfect option for espresso lovers, the Gaggia includes Rapid Steam technology and one touch auto frothing so you can be certain that your espresso is hot and your milk froth is spot on with each cup you brew. Its coffee dispenser is adjustable and will accommodate multiple sized cups and it is more compact than many of the espresso machines on this list, meaning it is great for anyone with smaller kitchens. If you are worried about the environment, you will be happy to know that this espresso machine uses low energy, and shuts off after an hour of idle time. Featuring a heavy-duty construction accented by stainless steel, this espresso machine definitely looks the part. It features programmable sizes for one or two cups of espresso and its 15 bar pump can provide rich crema and the perfect amount of foam to top off that rich espresso that you have been waiting for. 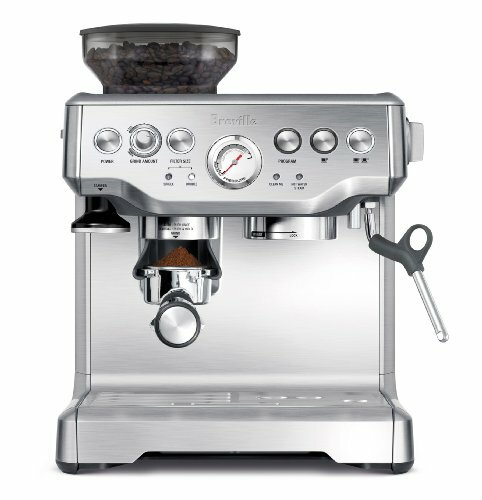 A fan favorite from a highly reputable brand, Breville, this mid-range semi-automatic machine is one of our all-time top picks. On the outside, you’ll find the sleek, distinct stainless steel design of Breville appliances (though you can also order it in black or red). Featuring a stainless steel conical burr grinder inside plus decent programmability, the Barista Express is the perfect marriage of user friendliness, flexibility, and convenience. With a 1600W thermocoil heating system and 15 bar pump, you’ll get a great,authentic shot of espresso within 2-4 minutes. 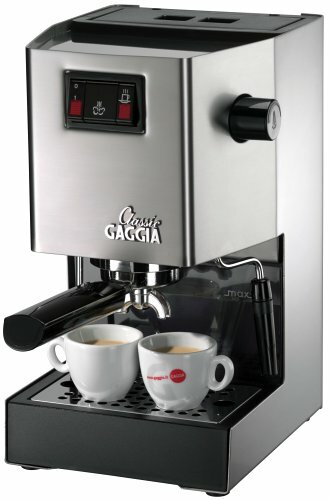 If you are new to the espresso scene the Gaggia Classic is a great machine for beginners. if properly maintained, the mostly stainless steel build materials will last a while. This is best suited for those who aren’t particularly interested in professional level frothing, as the steam wand can be little ungainly. However, it is compatible with both your fresh grounds and ESE pods, making it easy to operate no matter your preferences. Overall, this is a good mid-range option for newbies. A much more compact version of the De’Longhi models, this particular one will fit in areas where some of the larger machines just won’t go. That doesn’t mean it doesn’t pack in the features. In fact, you can expect this model to have as much, if not more, than some of the other models out there. It features a programmable digital panel with multiple presets and it even includes its own water filtration system so you can make sure your water is top notch for the perfect brew. It adds a patented single-touch hot milk section that allows you to slide the milk tank on for perfect lattes and cappuccinos every time. If space is an issue for you, then take a long hard look at this espresso machine. Not everyone has hundreds of dollars to drop on a top of the line espresso machine. So what exactly are you sacrificing when you opt for a more budget friendly machine? First of all, the build materials of lower-priced machines are typically less durable. They are often made with more plastic components, rather than the metal ones used for the top of the line options. This means the lifespan of your machine will be considerably shorter as these parts will deteriorate and break more quickly. Tip: Even if your machine is mostly plastic, make sure it has a stainless steel boiler. These machines should still be quite affordable but will last longer and brew better espresso. Additionally, because the parts are less durable, the machines typically don’t get as hot or as high pressure as their competition. So your espresso may be weaker and the flavors less distinct than you’d like. However, the strength should still be sufficient for most mixed beverages, even if it’s not the best to drink plain. You should also take note of the frothing or steam wand. The wands on these machines, if included at all, tend to be less ergonomic and more breakable. Also, you’re unlikely to find a machine wlth a whole lot of bells and whistles, which brings us to our next point. Lower-end machines tend to be pretty bare bones when it comes to programmable or adjustable options. So while you may be able to adjust cup size or strength, chances are it won’t go far beyond that. While this is probably a relief for an amateur home-based barista, it may be frustrating as you gain more experience or if you already have a lot. Additionally, many users opt for pod-based machines, like Nespresso or Keurig, when going for affordability. That means your options on grounds may also be limited. Above, we’ve recommended quite a few affordable espresso machines, including the Mr. Coffee ECM160 If you click this link and make a purchase, we earn a commission at no additional cost to you. 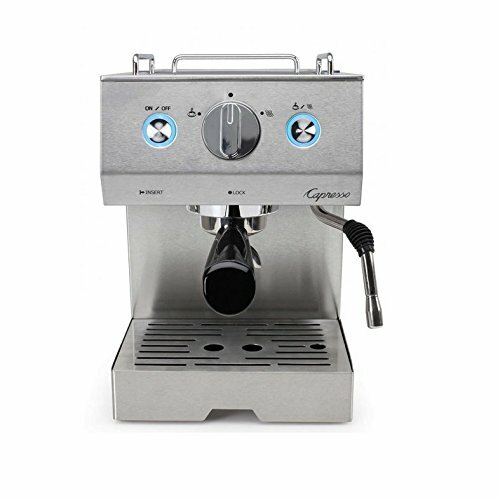 , Capresso 304.01 Steam Pro If you click this link and make a purchase, we earn a commission at no additional cost to you. , Hamilton Beach 40715 If you click this link and make a purchase, we earn a commission at no additional cost to you. , and BELLA BLA13683 If you click this link and make a purchase, we earn a commission at no additional cost to you. . But here’s some lagniappe on our top pick, so you know what to look for in your search for an affordable espresso machine. One of the first things you should note about this machine is the brands name. 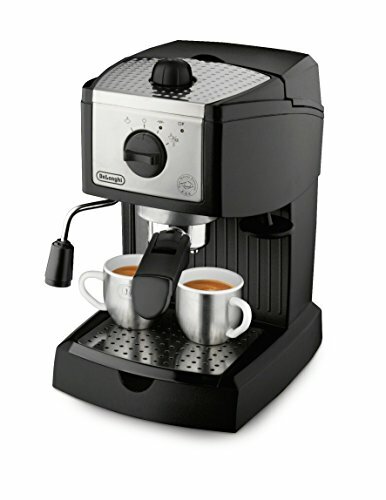 De’Longhi is well known for its range of both high-end and affordable products and is a reputable Italian brand. So you know their products tend to be high-quality, and this one is no exception. This machine is pretty basic but it does get the job done, featuring a self-priming function and a removable 32 oz water tank. It also includes a stainless steel boiler, milk frother, and tamper. So all you’d need at the start would be a frothing pitcher and a grinder. However, there have been some complaints about the latter two features being sub par, so you may end up replacing them. Even with the extra expenses, you can still get this machine and all of the accessories for well under $200. Make the most out of your machine by buying fresh, whole beans and grinding them yourself, rather than using pre-ground coffee. This can really make the difference between a great and mediocre cup of espresso. Take the time to read user manuals, even if your machine seems ultra simple. They can help you cut down on user errors to extend the life of your machine and improve the quality of your brew. Also, don’t discount stovetop and other alternative brewing methods. They may be better suited to your tastes and lifestyle than a traditional espresso machine. 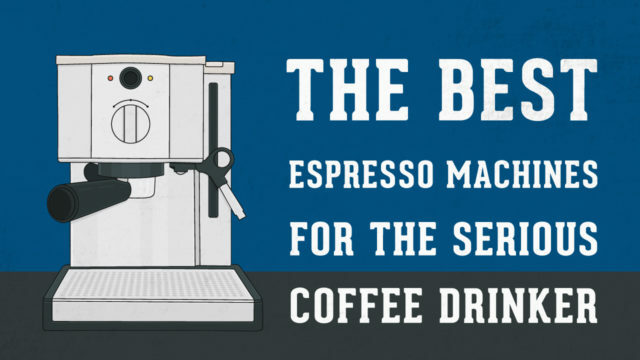 What drinks can you make with your new espresso machine? So, you’re thinking seriously of investing in one of the excellent espresso machines we’ve reviewed. But did you know that an espresso machine can make lots of other coffee-based brews, as well as just straight espresso? Well, coffee fan, you’ll be pleased to hear that this bad boy does! Once you’ve mastered the basics of creating the perfect espresso, the sky’s pretty much the limit when it comes to variety. Espresso typically uses the darkest roast and therefore creates a very concentrated brew with a strong flavor. Not much water is used to make espresso, so the caffeine content is pretty high. Caffè Americano is essentially one or two shots of espresso diluted with equal parts of water. You can drink it like that or add cream or milk if you prefer. An Americano is, therefore, a much longer drink than a plain espresso, although the caffeine content is the same. It’s also milder in flavor. The famous cappuccino originated in Italy and is reputedly named after the Capuchin friars, referring to the color of the habits they wore. The drink is made from basic espresso mixed with a small amount of foamed, steamed milk. The foamed milk forms the characteristic creamy head on top of the drink. The latte is an extremely popular coffee-based drink, loved by those who don’t like their brew too strong. It’s made like a cappuccino but in reverse. Steamed, frothed milk is placed in the serving glass or beaker, and the espresso shot is then poured into the center of the drink, from the top. Because of the volume of liquid that’s present in a latte, flavored syrups are often added. It is possible to make a perfectly acceptable latte without using an espresso machine, but we think the “proper” version is superior. A macchiato is a straightforward espresso-based brew that’s low in volume, but high in strength and flavor. Take one or two shots of espresso, depending on the potency of the finished brew you’re looking for. Steam a minimal amount of milk. Now spoon a tiny drop of milk onto the top of your drink. It’s that simple. If you’re a real hipster and flavor freak, you’ll love this! However, if you don’t like your brew too potent, you’ll want to avoid the Ristretto at all costs. A Ristretto takes the same amount of grounds but uses just half the water that it takes to make an espresso. You can use a basic Ristretto to make other drinks too, but they will also be super-strong and very high in caffeine. The jitterbugs among you will love a Ristretto! A Lungo starts with espresso and is then diluted with water. Although a Lungo sounds similar to an Americano, the additional water that’s added is derived from the brewing process, rather than being added afterwards. This means that the brew is stronger and has a darker flavor than an Americano. The beverages outlined above are just the tip of the brewing iceberg when it comes to making espresso-based drinks, using your new machine. Try using different flavored syrups, spices, and alternatives to cow’s milk to create your very own designer brew. If you want to continue enjoying perfect tasting coffee from your new machine, you can’t just speak nicely to it between brews. You’ll need to clean it regularly. The essential oils that coffee beans contain provide flavor and create the rich crema that tops your espresso. But oil residue gradually emulsifies, clinging to the water screen of your machine and on its brass surfaces. Oils also deposit a film on the portafilter and filter basket. Eventually, this film will block the filter holes in the basket and leave deposits on the portafilter spout. Bottom line – residual oils will eventually leave an unpleasant, rancid flavor in your coffee. Keeping your machine squeaky clean will also extend its life. There are a few basic cleaning tasks that you should carry out on a daily basis. Purge and wipe off the steam want following every use, and run a shot of water through your machine after each brewing session. Every 10 to 15 shots or at the end of every brewing session, carry out a clean water backflush. Once a week, or every 20 to 30 shots you’ll need to perform a more thorough cleaning routine, as outlined below. Before you clean your new espresso machine, check the manufacturer’s guidelines in the owner’s manual. Note that ONLY espresso machines with three-way solenoid valves can be back-flushed. Wipe away any residue from the shower screen. Snap the backflush basket into your portafilter, and add the recommended quantity of detergent. Run the espresso machine pump five times, leaving 15-second start-stop intervals between runnings. This process flushes away any coffee oil residue that is trapped in the system, cleans the valve, and removes ground deposits so that the valve seals properly. Rinse away any clinging deposits from the portafilter basket, the group head threads that lock the portafilter into place, and the rolled edges of the shower screen. Use a dishcloth dipped into some flushing detergent for this job. Rinse out the drip tray and blank basket to get rid of any remaining un-dissolved detergent. The water should now run through clean. If it’s still brownish, repeat the back-flushing process. Replace the drip tray and the clean portafilter. Repeat the backflush, using fresh water to get rid of any remaining detergent. Now clean the steam wand. Use a clean, damp dishrag to wipe the exterior of the wand. Use your brush and some clean, hot water to clean the inside of the wand. Place the steam wand into an appropriate container and purge it by opening the steam valve for half a minute or so. Now, rinse and wipe clean your portafilter and basket. Rinse and clean out the basket. Break down the portafilter, removing the spouts. Use a piece of Scotch-Brite to scour the inside surfaces of the spouts and portafilter. Put the basket and filter into a large container and add sufficient warm water to cover them. Add a small amount of cleaning detergent and allow the parts to soak for half an hour. Leave the handles exposed so that they are not damaged by the cleanser. Rinse everything thoroughly with clean water and wipe dry with a dishcloth. Re-assemble your machine, and you’re good to go. 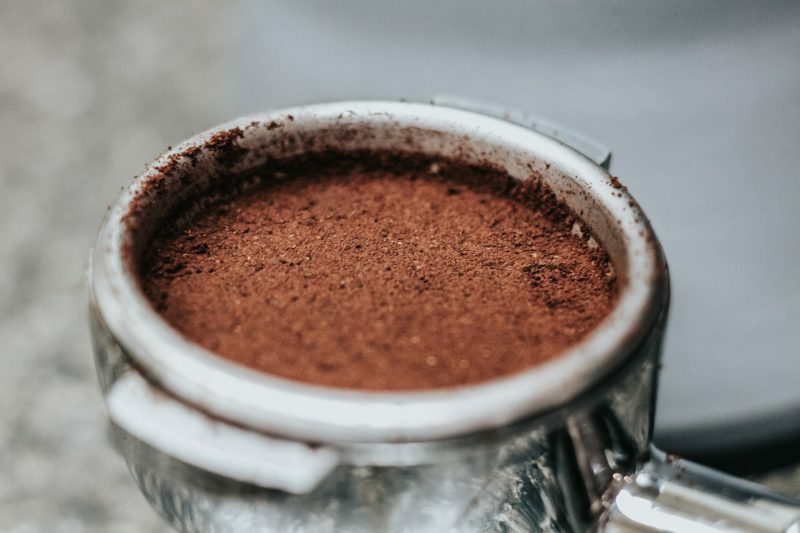 So, having discussed in some detail how to protect your espresso machine from the rigors of coffee grounds, what about the coffee beans themselves? What coffee beans should you use for the perfect espresso? The first thing to note here is that espresso is not made from a specific variety of coffee bean. That’s an urban myth. Espresso can be made using pretty much any type of coffee bean. Also, espresso is not a particular type of roast. More misconception … In fact, you can use beans that are labelled “Espresso Roast” to make percolator, French press, and drip coffee too. The most common types of coffee bean that are used to make espresso are Arabica and Robusta. Of the two, Robusta has a stronger flavor and higher caffeine content. Arabica is typically pricier and has a milder, sweeter flavor with overtones of fruit and chocolate. So, the type of coffee beans you use to create your espresso brew is purely a matter of personal taste. All espresso machines have similar features and working out which are important to you can be a challenge for the home barista. Now, bearing in mind how much coffee gear can cost, it’s essential that you know what you’re buying. Your first decision is whether to go for a steam-powered or pump-powered espresso machine. Steam-powered machines are typically the cheaper option. However, you might want to know that the very first Italian espresso machines were steam-powered and the coffee they produced was not popular. It was only when espresso was made using pump-powered machines that the beverage took off around the world. Unfortunately, many modern steam-powered espresso machines still have inconsistent pressure, which can result in substandard shots. Pump-powered espresso machines are consistent in performance. They’re better at temperature management, giving you far more control over your brew. The next main consideration when buying a home espresso machine is the kind of shot pulling feature you want. 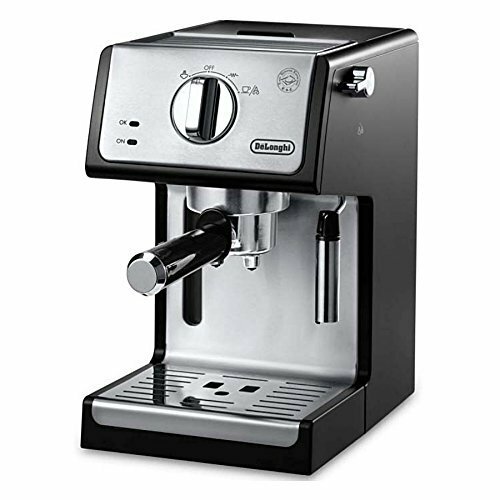 Semi-automatic: With semi-automatic espresso machines, you stop and start the shot by pulling levers or pressing buttons. This gives you absolute control over the grind setting and over how long you pull the shot for. Automatic: Automatic machines allow you to start the shot, but the machine decides when to stop it after a certain elapse of time. Sometimes the shot time is adjustable; sometimes it’s not. You still have control over the grind setting. Super-automatic: Super-automatic machines do everything for you. They grind the coffee, steam the milk, and pull the shot. The only decision you make is on the bean that’s used in the machine. So, the bottom line is this. Semi-automatic machines allow you to decide on the balance and taste of your shot. You have slightly less control with a semi-automatic, and a super-automatic effectively plays the role of the barista, leaving you twiddling your thumbs. For the dedicated home barista, semi-automatic machines are the way to go. The pre-infusion feature allows you to push a small quantity of water into the coffee to kick-off the brewing process, allowing the grounds to degas before full pressure is applied. This process gives you a more balanced brew and is something that we would prioritize. Cheaper machines only have a temperature gauge. Although you can still produce great shots with a machine like this, a display that tells you how long the shot has been pulling for and gives you the internal pressure of the machine makes it much easier to produce excellent coffee. For the sake of a few extra dollars, we’d recommend choosing a machine with an electronic display. After all, you can never have too much information, right? Many pump machines have a secondary water spout, often called a “tea water dispenser.” Although this spout is intended for filling tea mugs, it’s also very handy for heating up your coffee mug before making a brew. In a home-brewing setting, a tea water dispenser is a nice-to-have, rather than an essential. You want steamed milk that’s smooth, creamy, and the perfect temperature. Cheap wands give you over-bubbly, stupidly hot milk – avoid! If you have an area on your kitchen counter that allows you access to plumbing, you may want to choose an espresso machine that can be connected directly to the water line. With this set-up, you won’t ever need to worry about your machine running out of water, because the machine draws water directly from the line. For those of you without the facility of direct water line access, a machine with a water reservoir or water tank is your only other option. These machines are generally cheaper and are ultimately more portable. The specialty coffees served in coffee shops generally use a standard double espresso shot. A standard double espresso shot takes 16 to 22 grams of coffee grounds to produce 30 to 40 grams of espresso. If you want this for your home brewing experience, you’ll need to make sure that the espresso machine you choose has a group head that’s large enough to fit portafilters of that capacity. Be aware that most low-end machines have much smaller portafilters. Bear in mind that a larger portafilter allows you to pull larger shots, giving you more caffeine content, more flavor, and allowing you to split shots between two drinks if you want to. The features mentioned above are the main ones to look out for when you’re buying a home espresso machine. At the end of the day, an espresso machine is a valuable tool, but it’s the quality of the beans you use that will determine whether your final brew tastes excellent or not. Always buy freshly roasted, high-grade beans to be sure that your new machine gives you the results you’re looking for. Single boiler or double boiler? The best espresso is said to be made by forcing 1950F through fine grounds with around 10 bars of pressure. Single boiler espresso machines use just one boiler for heating both the water for the espresso shot and the steam wand. Although this means that require more downtime between the two processes, they are much cheaper than their double-boiler relatives. If choosing a good espresso machine is important, selecting the right coffee grinder is absolutely essential. If your coffee beans aren’t ground uniformly and to the right consistency, your coffee will taste lousy. You need to find a grinder with burrs that are specially designed and made to pulverize the beans to a very fine grind. The best grinders have the facility to change the ground size from French press to espresso. 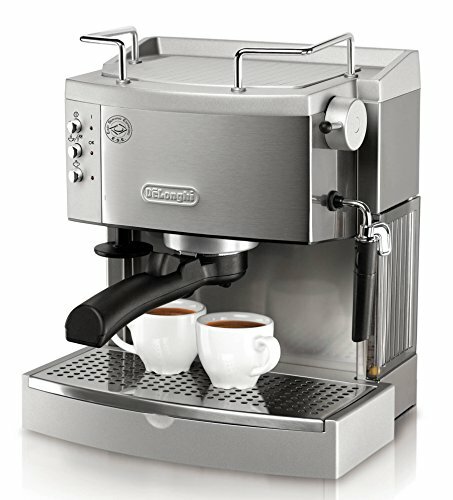 Bean-to-cup espresso machines such as those used in coffee shops are the most expensive. These machines have an integral grinder. You need to consider the cost of buying a separate, good-quality grinder against paying more for an espresso machine that already has one built-in. If you decide to buy a separate grinder, avoid blade grinders at all costs; these cheap machines destroy any flavor that the beans contain! Look for a grinder with flat burrs, which produce a better flavor than conical burrs. The burrs have a grooved top and bottom plate, which rotate against each other. The distance you set between the burrs determines the texture of the grind. The larger the burrs, the better the heat dispersal during the grinding process. If you grind large quantities of beans at a time, the larger the burrs should be. Grinders can also be categorized by whether they have a micro adjustment facility or a stepped adjustment facility. High-quality machines have a micro adjustment setting, which gives you more control over the timing of the extraction process. A glance along the aisles of any major kitchen equipment store or a quick Google search will reveal dozens of different espresso machine brands. The choice is mind-blowing, not to mention confusing. We’ve put together a list of some of the most trustworthy brands for you. 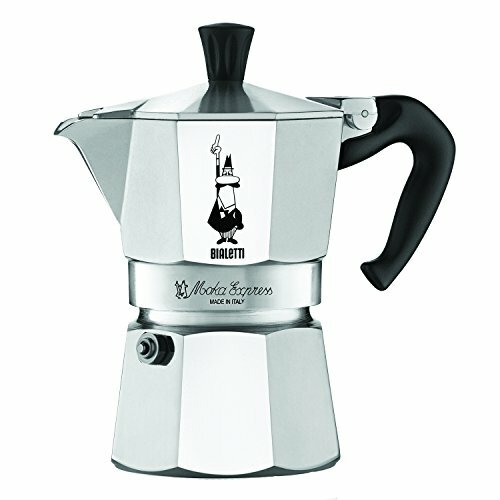 All these manufacturers have solid reputations as makers of high-quality, value for money kitchenalia, including espresso machines and other coffee-making gear. De’Longhi has been around since 1902. This family-owned business manufactures kitchen equipment and small electrical items, including an extensive range of high-quality coffee machines. Nespresso is a very well-known maker of espresso machines. Most people have seen their TV ads, featuring George Clooney, suavely making himself the perfect espresso with one their machines. Hamilton Beach is a small US company who design, market, and distribute a wide range of home and commercial kitchen appliances. They make high-quality espresso machines and have a growing reputation as the go-to brand for the home barista on a budget. The Italian company, Bialetti have been making high-quality espresso machines since 1933. Over the years, Bialetti has established themselves as a producer of top-notch coffee making kit and other small domestic appliances. You won’t go far wrong if you invest in one of the stunning home espresso machines. Bella Housewares make kitchenware for the busy modern woman. They pride themselves on manufacturing small, efficient kitchen appliances that make your kitchen FUN! In addition to your coffee machine, you’ll receive tips, product videos, and recipes – all via social media. 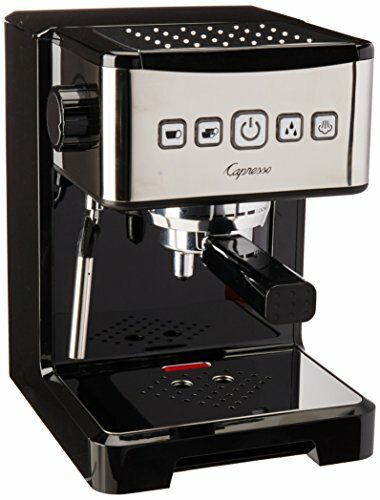 Capresso is a Swiss-based company that make high-end espresso machines, grinders, coffeemakers, frothers, and water kettles. Their products are not cheap and are aimed firmly at the discerning roaster who takes home coffee making seriously. That said, if you want your coffee done right and you want a superior product that will last a lifetime, Capresso is where it’s at. The Australian company, Breville have been around since 1957 when they began business as an importer of electrical household appliances. 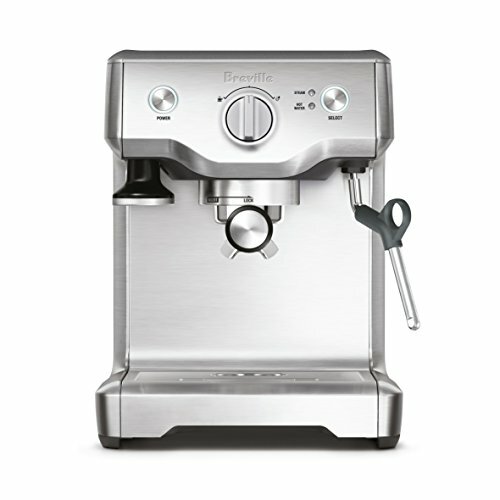 Breville supplies everything from sandwich makers and irons to espresso machines. For an affordable, decent quality home coffee maker that’s built to last, Breville is an excellent brand to choose. 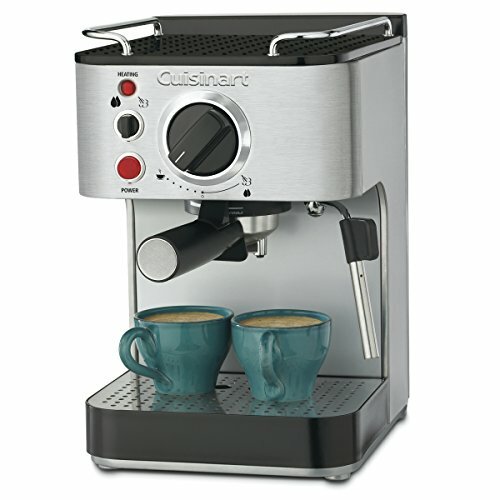 Cuisinart is a world-renowned maker of kitchenalia, including home coffee making machines. This US-based company has been around since the early 1970s and have a solid rep for producing decent quality kit at affordable prices. 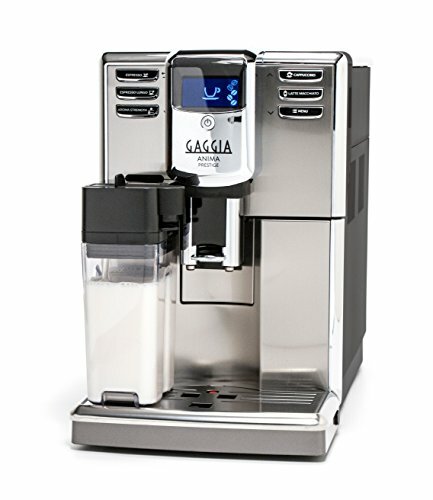 The UK-based company, Gaggia specialize in making high-quality bean-to-cup coffee making machines, primarily for home use. 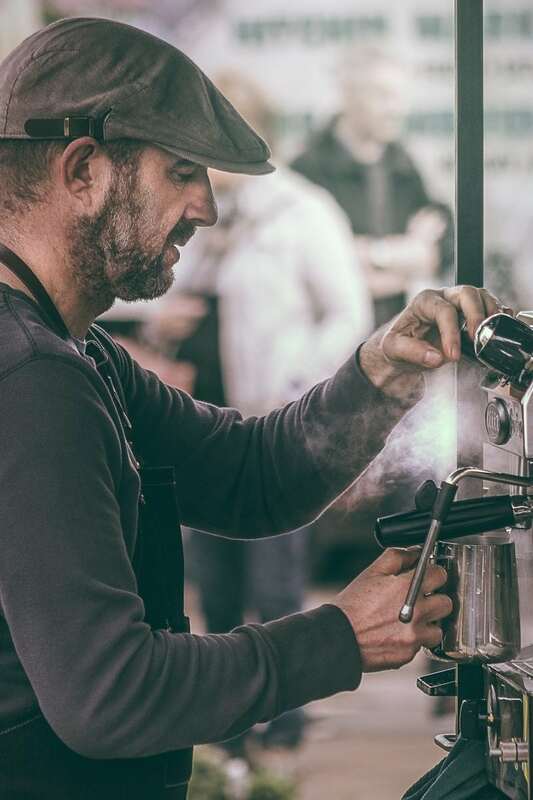 Although you can expect to pay a healthy sum for one of their espresso machines, the investment will pay you back with a lifetime of top-quality brews, time after time. 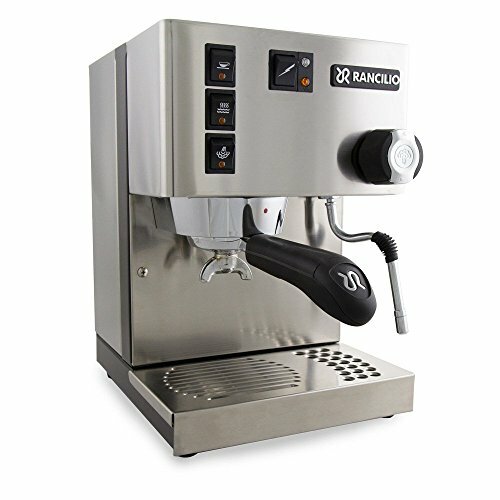 Rancilio was founded in 1927 in Italy. Since then, they have been making espresso machines for the commercial market, although they do also offer a machine that’s aimed at the home barista. Rancilio’s experience shows in the superior design and performance of their high-end products. No complete guide would be, well complete, without an FAQ section. Here we answer the questions every self-respecting home barista needs to know. Q: Can you make espresso without a machine? Q: Why are espresso machines so expensive? A: The simple answer to this question is, “You get what you pay for.” Decent-quality espresso machines and coffee grinders are precision-crafted, industrial-grade pieces of high-tech kit. Espresso machines are designed and built to perform close-tolerance operations, using highly pressurized hot water/steam, and finely milled, precision-ground coffee beans. In essence, you’re buying an industrial grade tool, not a bog-standard kitchen appliance. Q: What espresso machine does Starbucks use? A: The majority of Starbucks stores currently use the Mastrena High-Performance Espresso Machine, an automatic bean-to-cup espresso maker. Bean-to-cup machines remove the requirement for a separate coffee grinder as the process is integral to the machine. The Mastrena only grinds sufficient beans for each cup of coffee, ensuring that the freshness of the beans and their flavor is preserved. With this kind of machine, you also get to enjoy the sound of the grinder working, which you don’t get with machines that use pre-packed, ready-ground coffee. Q: What’s a heat exchanger in a coffee machine? A: A heat exchanger means that the machine has just one boiler. The machine has one element that can provide two different temperatures, one lower temperature for brewing, and a higher one for steaming and providing hot water. This means that you can brew and steam simultaneously. Q: What does tamping espresso mean? A: Once you’ve loaded coffee into the porta filler handle, you’ll need to tamp it down. Tamping means compacting the coffee grounds evenly. Tamp too hard, and the flow of water through the grounds is restricted, resulting in coffee that tastes bitter. Not enough pressure and the water runs through the grounds, leaving the flavor behind. Finding the ideal pressure takes practice, but this also depends on your personal taste. Q: Do you need to descale your espresso machine? A: Yes, you do! Limescale will kill your espresso machine stone dead if you don’t keep it under control. The method of descaling your machine will depend on the make. Always consult the owner’s handbook for instructions before attempting to carry out this operation. You should descale your espresso machine at least every couple of months, more frequently if you live in an area that has very hard water. Q: Is a good grinder important for quality espresso? A: Absolutely! An inferior grinder will damage the coffee grounds by burning off the oils before you’ve even brewed the coffee. No matter how high the quality of the espresso machine or the beans themselves, if the grinder is poor, the coffee will be too. We believe that one of these espresso makers will do just the trick if you are ready to get something more out of your coffee drinking that you have not experience before, at least at home. Why head to a coffee shop every time you want something other than basic coffee? With one of these handy machines, you can bring the coffee shop right into your kitchen. If you do, I guarantee you will never look back.